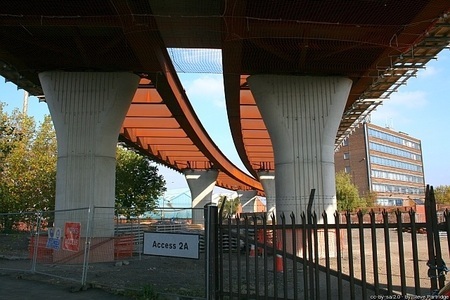 Murray Steel Products are leading suppliers of weathering steel plate and Corten steel equivalent materials to the UK’s construction, rail, bridge building and architectural industries. We stock large quantities of certified weathering steel in a range of grades (including some equivalent in properties and performance to materials branded Corten Steel) suitable for structural applications and external use without the need for protective paint. Certified materials are available in standard sizes from 2m x 1m up to 12m x 3m and in thicknesses from 2mm to 360mm. Additionally, we can supply non-standard sizes, which can help to manage your costs by reducing wastage in the manufacturing process. Murray Steel Products also have an in-house ISO 9001 and CE Execution Class 4 accredited processing operation, which can manufacture custom profiled and drilled components, and cut plate to your required size. Contact Murray Steel Products on 0161 866 6999 or via the website to request a quote for weathering steel plate or profiles.